14 Reasons Why Indiana Jones and the Temple of Doom is Underrated | I Review Too . . .
2014 marks the 30 year anniversary of Indiana Jones and the Temple of Doom, one of the most controversial sequels in geek culture. Immediate reaction to this dark prequel wasn’t kind. After all, it sees our fedora wearing hero flung into the depths of occult madness and child slavery. No easy sell. Story man George Lucas was to blame for the film’s divisive tone, hoping to utilize the same brooding uncertainty that made The Empire Strikes Back so popular to Indy’s advantage. Fans didn’t really agree and a few years later even director Steven Spielberg admitted it was a risky move and one he wasn’t quite sure paid off. Literally. Whatever your feelings towards Temple of Doom, you can’t say it doesn’t do exactly what a good adventure movie is suppose to do. 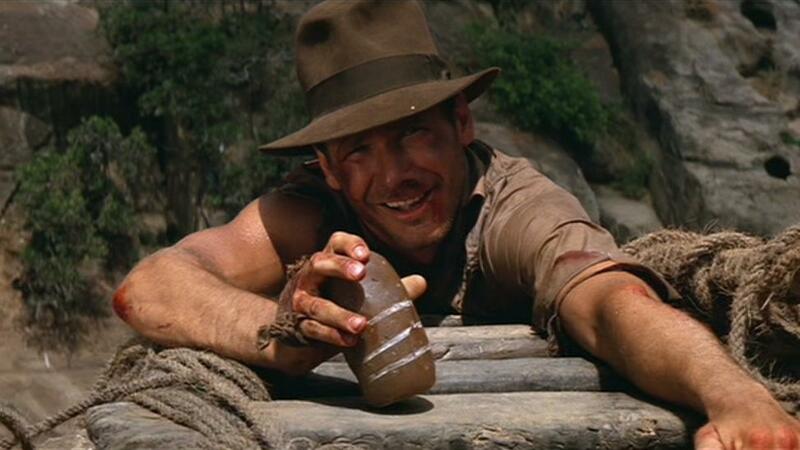 Within the first half hour, Indy’s been poisoned, shot at through the streets of Shanghai, made a questionable escape from an abandoned plane and survived a huge waterfall drop with nothing more than a rubber dingy. Still with us? Good. 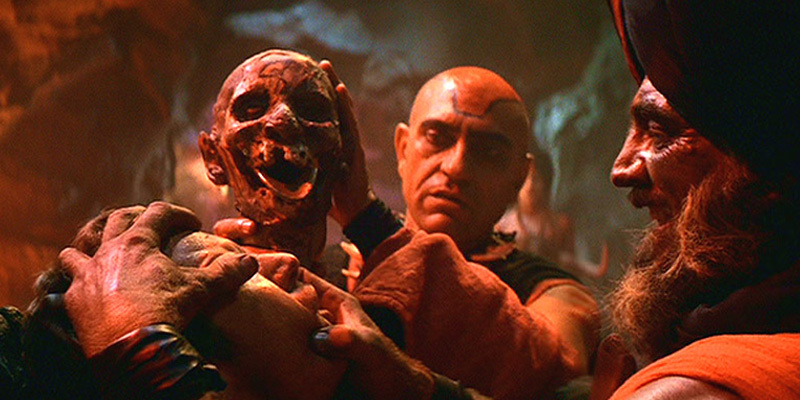 Speaking of PG-13, Temple of Doom is dark, both figuratively and aesthetically. 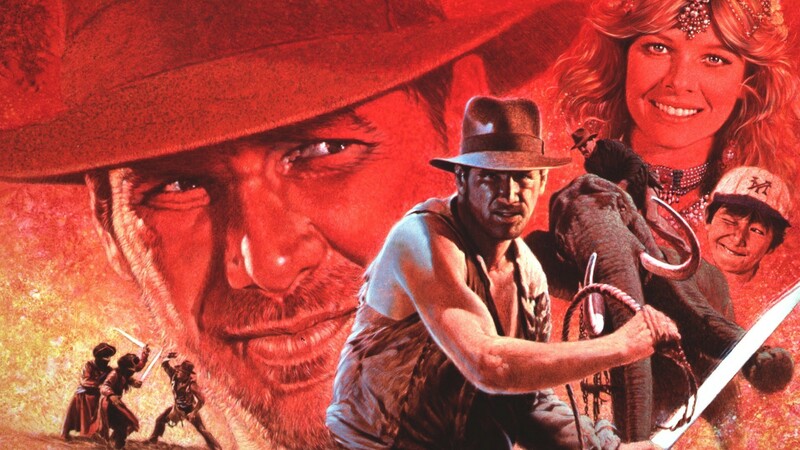 Think back on Indy’s second cinema outing and what images spring to mind? They’re likely to be shadowy, cave-dwelling altars drenched in the blood red light of Mola Ram’s built-in sacrificial fire pit. Seriously, at one point you see a human heart removed from some poor bloke’s chest. Avert your eyes, Shorty! The age of the dark kids movie may have faded a bit lately but for a glorious period in the late 80s and early 90s we were gifted loads of fantastical kids flicks that weren’t afraid to show teeth. Temple of Doom was instrumental in ushering in this era. Along with fellow thirtieth birthday buddy Gremlins, the movie’s dark tone, blood guzzling and penchant for kid whipping helped create the PG-13 rating that made our childhood movie experiences just that little bit more fun. Despite its dark tone, the film flows quite well from one set piece to the next. Indy’s thrown into this adventure (literally) and so are we. In doing so, there’s little time dedicated to bloated McGuffin explanation and much more space for claustrophobic spiked rooms, mine cart escapes and chilled monkey brains. People often complain about Temple of Doom being the weakest of the series (well, they did before Crystal Skull) however in actual fact it’s the film that’s closest to the material that inspired it. George Lucas always imagined Indy as a grizzled matinee hero. The kind of guy who found himself in unfathomable scrapes, wrestled crocodiles (not snakes) and managed to move faster than a falling temple door to grab his trusty hat; part comic book hero, part every man. With Temple of Doom, that’s exactly what we got. All those moaning about it being the worst of the sequels might want to rewatch the opening credits. 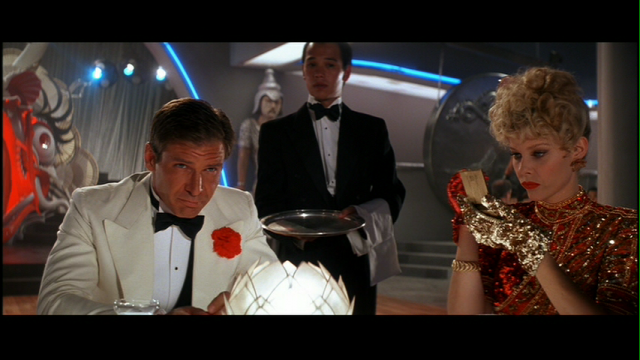 As most people know, Temple of Doom is set in 1935, a whole year before boulders rolled and arcs attacked. This chronological decision may have been made to avoid retreading on Nazi ground but it’s a handy geeky tidbit to whip out at the pub whenever someone’s dissing your favourite Indy ‘sequel’. 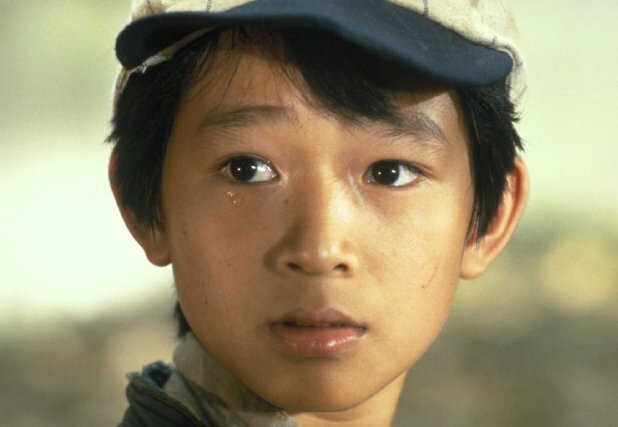 While it may have led to a lifetime of strangers yelling ‘Okie dokie, Dr Jones!’ at poor Ke Huy Quan (now just Jonathan Ke Quan) whenever he walked down the street, Short Round has since become synonymous with Indiana Jones. This unlikely pairing gave Indy a literary-hero type quality and unveiled a paternal side to the character that was never quite captured in the same way again, even with his own son. Despite (and probably because of) its dark tone, Temple of Doom has quite a bit of comedy flecked throughout its 118 minute run time, providing a refreshing slice of levity to the adventure. 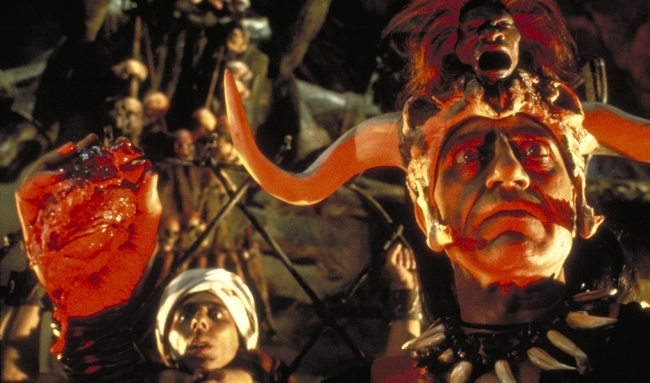 However sticking to its shady theme, it’s also the Indy film with the darkest humour – from Dr Jones casually dismissing the time he almost lost his ‘misunderstanding’ to a disgruntled Sultan, to a hilarious hammer-bonk to the head that never gets old – it’s one of Temple of Doom’s shining qualities. 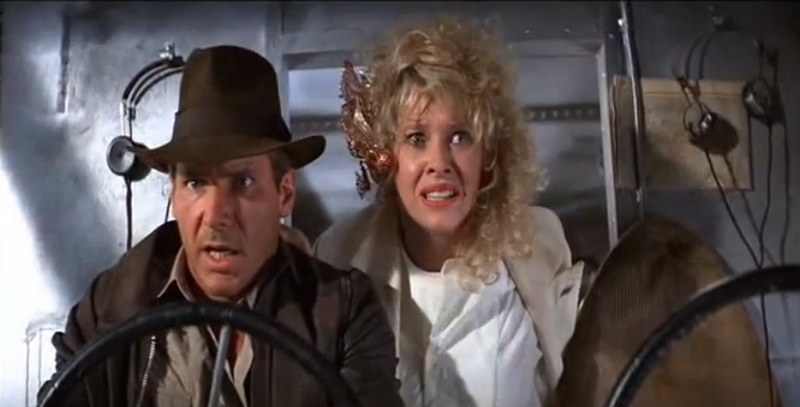 Opening sequence craziness aside, we get plenty of hero moments in Temple of Doom. The bridge sequence towards the movie’s climax immediately springs to mind, with Indy scrabbling to safety after a dangling fight with Mola Ram, lost Sankara stone in hand. It’s a sequence that Spielberg and co would revisit during a tense tank scramble in part three, but you saw it here first. Perhaps the crowning glory of Temple of Doom is that it was the first time Spielberg really framed Indy as a cinema hero, officially introducing us to that iconic silhouette. The real money shot comes shortly after Indy’s stint on the dark side where, together with Shorty and Willie, the trio face the hefty task of escaping with everyone in tow. Framed in light and ready for a fight, the fedora tipped silhouette cast by Harrison Ford cemented itself into the public consciousness and has been there ever since. Drew Struzan’s expertly sketched, coloured and composed one sheet for Indiana Jones and the Temple of Doom screams adventure. One look at it and you instantly get a taste of exactly what you’re in for: action, adrenaline and the unknown. Plus, it looks awesome framed and on your wall. On top of Struzan’s poster you’ll find a perfectly phrased tagline for the movie, something which doesn’t really re-appear in parts three or four yet immortalises the character as the personification of adventure. 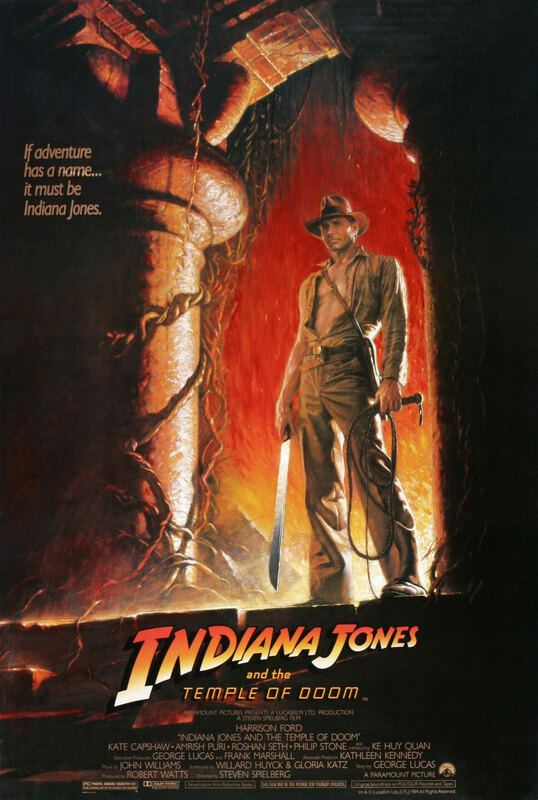 ‘If adventure has a name…it must be Indiana Jones’. What more do you need to know? Some people love snakes, some people keep rats as a pets but not many people are head over heels for bugs. The floor sequence in Temple of Doom is without a doubt the most unnerving of all the pest invasion scenes. The cast would probably agree too, as producer Frank Marshall explains, “When filming the bug scenes, crew members would go home and find bugs in their hair, clothes and shoes,”. Nice. Above all else, if it wasn’t for the existence of Temple of Doom we might not have the rest of the Indiana Jones trilogy. Despite fans’ varying reactions to the movie, it paved the way for things to come whilst adding some new dimensions to the character that helped shape his overall arc. 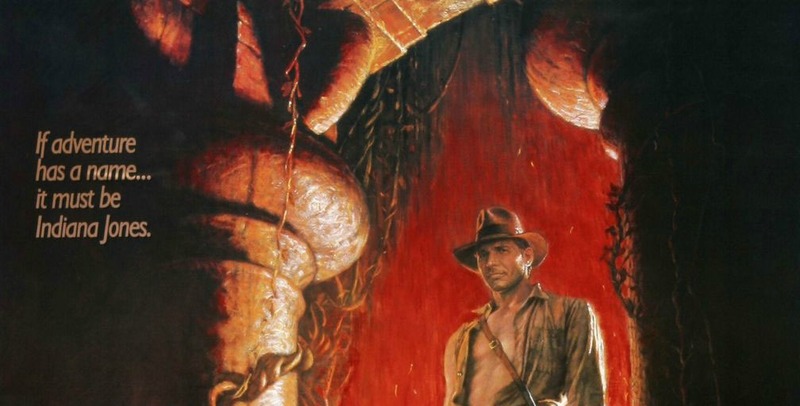 One journalist has even gone as far to suggest that it was Indy’s most important adventure; one that taught him the necessary life lessons that made him the character we know and love. From “Fortune and glory” to “It belongs in a museum” in one non-stop swoop, Temple of Doom is arguably Indy’s most important adventure. 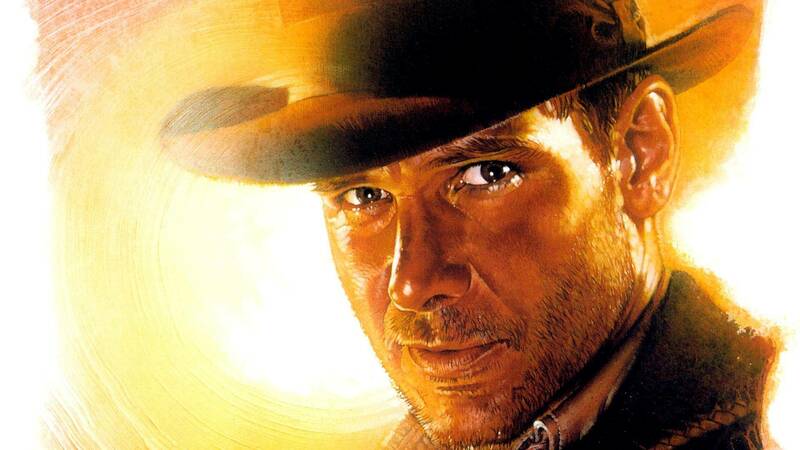 Posted in Cool, Features, Film and tagged Feature, Film, Indiana Jones, List, Temple of Doom. Bookmark the permalink. I really enjoyed this list and agree with most of it, but a couple things. There are multiple shots in Raiders that show Indy in silhouette, that was iconic from movie 1. Also, pretty sure Struzan did not illustrate that original Temple of Doom poster. Not sure of the artist’s name, but you can tell it’s not in Drew’s style. He went on to make the poster with all the characters in it.